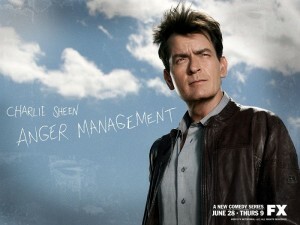 When FX first announced that their Charlie Sheen-led sitcom Anger Management was to be given a 90-episode extension past its first season, that was the cue for many people to envision a minimum of 4 or 5 seasons for the series to continue into. However, the latest announcement is one that will surprise many, as the second season, set to premiere on 17 January and on every Thursday after, is almost literally set to be ‘every Thursday after’, after it was confirmed that season 2 and season 3 will run for 45 episodes each over the next two years, according to the network. The high ratings of season one were enough to give the show its high-quantity renewal, though the unusual structure in which it will be aired will certainly turn some heads, but ensures that fans of Anger Management will not be without a new episode to look forward to for much longer than a few weeks at any one time. The new series will include Jane Lynch (Glee) as a guest star, and Charlie Sheen’s father Martin Sheen (The Departed) becoming a regular cast member in the role of ‘Charlie”s dad. The younger of the Sheens claimed last year that the decision to renew with 90 episodes was one that was ‘not enough’, stating the experience of working on the show to be ‘exciting as hell’, but will he still feel that way once they’ve actually filmed that much content? While many different companies, networks, and producers have their own varying definitions on what constitutes a ‘season of entertainment’, 2 x 45 is an equasion that is better-known in the sport of football, so how will this stretching of the limit fare?